Many Maplewood students have been looking for good community service projects to participate every summer. Our students believe that through meaningful community services, they can gain a deeper understanding of their community, show their concern for others, and develop better awareness and maturity in themselves. Not to mention the fact that solid, reflective community service experience is an important personal attribute that top US colleges and universities would always look for in assessing their applicants. Riding on our successful experiences in 2005 and 2006, Maplewood is again coordinating the Chinglin Tutoring Program, an English peer tutoring program for students in summer 2007. Volunteer students are now being recruited to provide conversational English and reading/writing workshops to fellow students attending a local middle school in Hong Kong. Interested parents and adults are also welcome to participate in the program. To let students from Fukien Middle School (North Point), a local junior secondary school and a Chinese Medium of Instruction school, improve in their general English language capabilities and better prepare themselves for future HKCEE exam (high school certificate exam in Hong Kong). To provide the tutoring students an opportunity to participate in a meaningful community service close at home. To let tutoring students meet their peers who may have come from different socioeconomic backgrounds. For example, most students at Fukien are New Arrived Students who have only started to learn English formally in their senior primary or junior secondary school. To allow students to be proactive in community service by taking ownership of the program with minimal guidance from Maplewood consultants and Fukien teachers; to let them plan and work cooperatively with people, to initiate and implement projects, to share their energy and skills, and to motivate and learn from their own peers. To ensure the program will be a solid and substantive community service experience, volunteering students are expected to put in at least 30 to 45 total hours of tutoring within a 3-week period from July 16 to August 3, 2007. The hours will be 2 to 5 pm Mondays to Fridays inclusive. Interested students (and parents, as well) may send a email to chinglin@maplewood-edu.com to register your interest to participate or ask for more information. A program briefing meeting will be scheduled for in early July at Maplewood to let all volunteers meet and plan the program in further details. As in 2006, we expect 20 to 30 students from Fukien Middle School (North Point) will sign up for the tutoring program. They are finishing Form 3 and plan on attending Form 4 in other secondary schools in Hong Kong. (Read sidebar info on school.) These students need help in improving their English language capability to allow for a better school transition and to sit for the HKCEE exam in two years' time. Our positive experience in the the Chinglin Tutoring Program in the past tells us that Chinglin 2007 will be warmly welcomed by our student participants and will turn out to be a rewarding summer learning and service experience for all. We look forward to your active participation and support! Go to Program 2007 update. 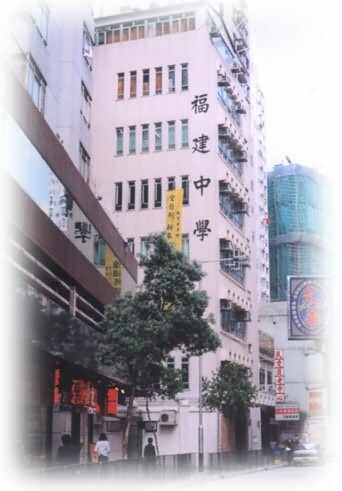 Fukien Middle School (North Point) at 1 Java Road, Hong Kong. The summer tutoring program is named Chinglin Tutoring Program after the location of Hon Wah Middle School where the summer peer tutoring program was first organized in 2005. Chinglin 青蓮 means the Green Lotus, and sounds the same as Youth 青年 in Cantonese. Fukien Middle School (North Point) plays a unique role in education in Hong Kong as the first junior secondary school to provide a "bridging" class for New Arrived Students (those who have recently immigrated to Hong Kong primarily from the mainland). Students enter the school for a special "bridging" program up to 6 months to help them adapt to the languages (both English and Chinese in traditional characters), school curriculum, social and cultural environment in Hong Kong before transferring to regular secondary schools. Fukien Middle School has been providing bridging programs since September 2002. Chinglin Tutoring Program 2006 totor experience sharing; students' reflections. Copyright © 2004-2007 Maplewood Education Services Ltd. This page last updated 07/16/07 10:07.